You can remove an alias address from a distribution group in Office 365 using PowerShell with the Set-DistributionGroup cmdlet. If you need to add an alias, see this post. You will be prompted for your Office 365 credentials and your session will be established and the email address will be removed from the distribution group. Although it is possible to assign many email aliases to a single account in Office 365 it is not easy to send as an alias using Outlook when composing a new email. There are two workarounds to this, the first is to use a distribution group and assign users permissions to send from that distribution group. 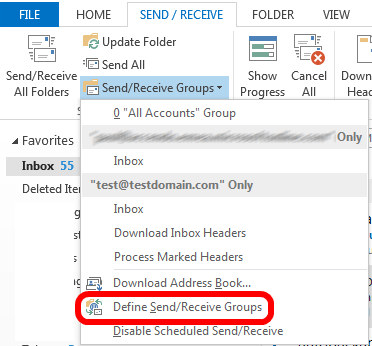 The second, which is the method documented in this post is to set-up a second mail account within Outlook and use the account to send mail via the Office 365 SMTP servers. 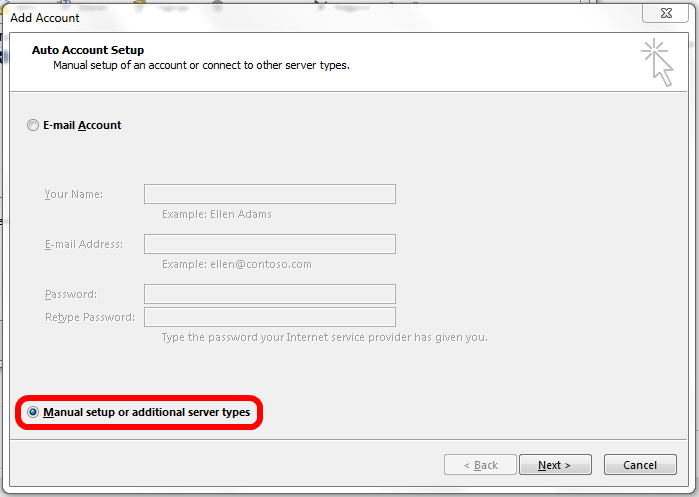 This will give you the ability to select the alias using the “From” button when composing a new email. The idea behind this method is to setup a second account in Outlook that will allow sending from an alias that has been defined in Office 365. It would be better if the ability to send as an alias was native to Outlook/Office 365, but it isn’t. See these instructions for how to add an alias with Powershell. 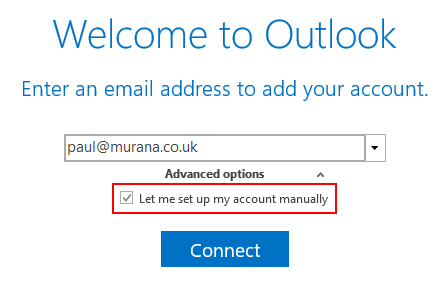 Before you can proceed, you need to find your SMTP settings: To do this, login to Outlook Web App, click on the little cog in the top right of the screen to bring up the options menu and click on options. I expect your settings will be the same as mine, which means your Office 365 SMTP Server will be smtp.office365.com. 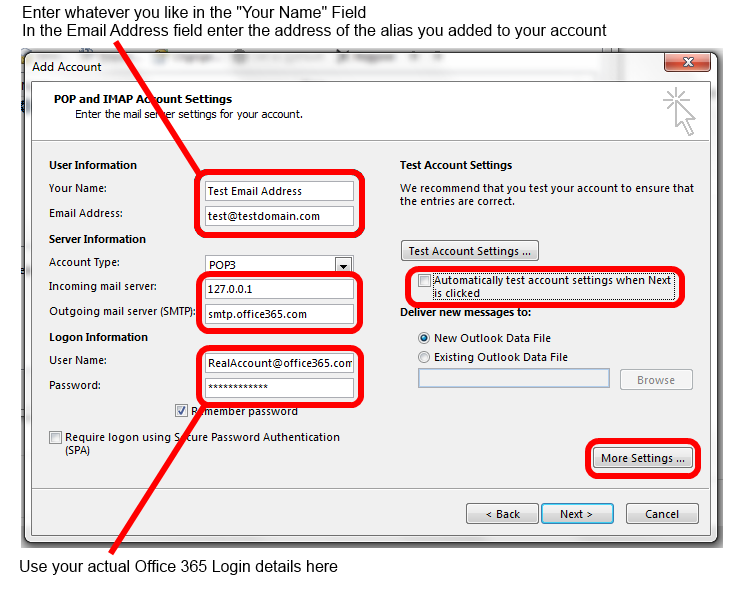 Before proceeding ensure you have added the alias that you want to send from to your Office 365 account. On the next screen choose “POP or IMAP” and then press “Next”. “Your name” is the display name that will be presented to the recipient. “Email address” is the email alias that you added to your account in Office 365. Account Type should be POP3. Username should be your actual Office 365 username, not an email alias. Password should be set to your Office 365 Password. 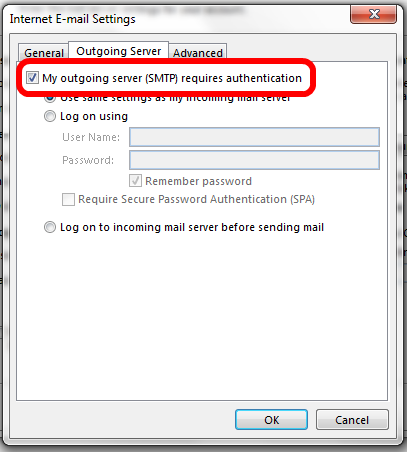 Click on the “Outgoing Server” Tab and then tick the box “My outgoing server (SMTP) requires authentication”. 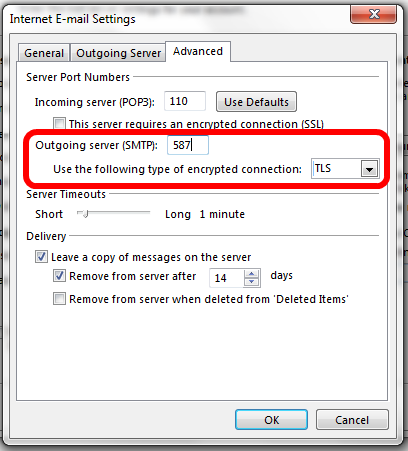 Click on the “Advanced” tab and then change the “Outgoing Server (SMTP)” setting to 587 and the encryption type to “TLS”. Click OK to return to the previous screen and then click next to add the account. On the next screen click finish. When the account was created Outlook created a new PST file for the new account. We don’t need that as we are not going to be receiving any emails on this account. You should now be back at the E-Mail accounts screen. Click on your new account to highlight it and then click on “Change Folder” option. Select your inbox from your main Exchange account. Click OK and then Close. The new PST file will still be in your folder list, but you can remove it by right clicking on it and choosing close. Now your account is set-up and you will be able to send email from this address by simply selecting the from address when composing a new email. If you found this post helpful, I’d really appreciate it if you rated it. 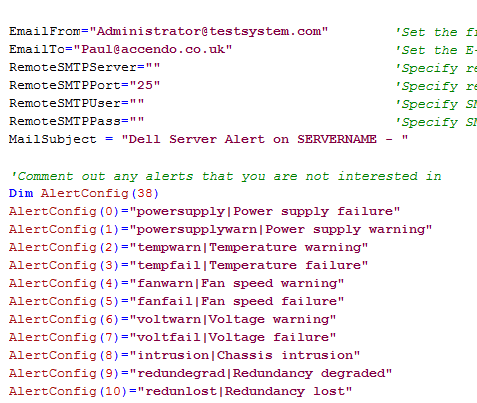 Earlier this year I posted a script which sends email alerts from Dell servers using the alerting system built into Dell Openmanage. However, that script will only work on Windows systems. A visitor to the blog called Steve has kindly posted some code on that post which enables the same functionality in Linux and I think it is worthy of its own post. Before attempting to use the script you will need to download this perl script called sendEmail and that you have unix2dos installed. The script accepts two arguments, which are setup or show. “setup” will set the alerts action to the value of $alert_script which should be the full path to the script itself. “show” will print the current alert settings for the system to the screen. A good way to test the script is to temporarily set the “Temperature Maximum” to something low like 12 to trigger an alert. Again, big thanks to Steve for posting this and I am sure it will be useful to lots of people. This has also inspired me to make some improvements to my original Windows version. So just fill in the fields below and the command will be built automatically in the box below. Then just copy into command shell. If required, seperate the “Subject Alternative Names” with commas. I am thinking of duplicating this code and writing another post which will generate the commands for the import of the newly generated certificate. Dell Openmanage Server Administrator is a really useful tool for configuring and monitoring server hardware but it lacks built in E-Mail alerts. It is capable of executing scripts when a server alert is triggered so I have written a simple script in VBScript that provides the missing E-Mail alert functionality. If a remote SMTP server is not specified the script will try to use the local machine to send the E-Mail. Let me know how you get on and leave any questions in the comments area.